Figi's® Grandma's Fruit Cake Ring is dee - licious! I'm sure you're familiar with the old joke... the one about sending fruit cake to acquaintances you're less-than-fond of. We sure are. Which is why we were skeptical at first. But one taste, and we here at the Guide were believers, and you will be too. Festive Fruit Cakes are created from an Old World recipe, blended and baked in a time-honored tradition that takes all afternoon. 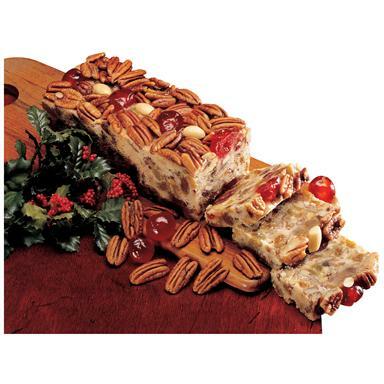 Made with fresh butter and egg yolks with plump cherries, candied pineapple, walnuts, almonds, pecans, golden raisins. Mmmmmm. Grandma mellows this cake with 100-proof bourbon, premium dark rum, and 84-proof brandy. Makes a great gift! Each load comes unsliced and gift boxed. Available fresh year round. Note: We do not accept returns on food items unless truly defective.